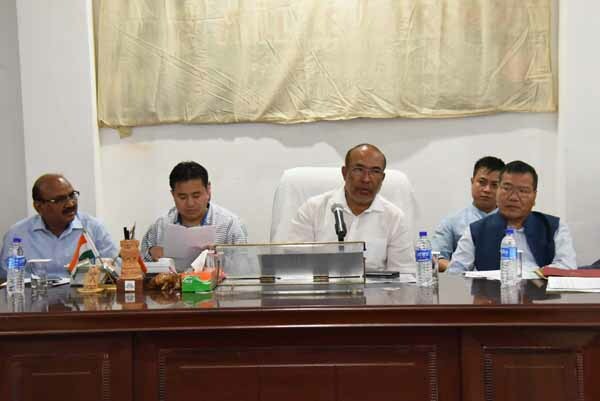 Chief Minister N Biren Singh urged government officials to change the working style of offices to bring positive change and for the welfare of people. He was addressing a review meeting of ‘Go to Village’ mission held at Darbar Hall of Chief Minister’s Secretariaton Friday. He said that the government officials might be facing difficulties and inconveniences under ‘Go to Village’ mission, however we must consider these situations as a part of the profession. He mentioned that people have started supporting the ‘Go to Village’ mission and government is getting positive feedback from the people. During the meeting, he also said that we must chalk out further plans so that the ‘Go to Village’ mission can be sustained as a long term policy of the Government for the welfare of the people in future. He said that in the next three weeks, we should identify and digest all the grievances gathered during the previous camps under the ‘Go to Village’. “We should re-visit those villages and deliver the services to the aggrieved people on June 26, 2018. Within these three weeks, Zilla Parishad members, Pradhan ADC members and SDCs etc. should also identify the grievances of the people,” he added. Mentioning that a collective effort is needed for the success of the mission, Chief Minister said that the Chief Secretary would convene a ‘review meeting’ with all Nodal Officers and Administrative Secretaries to chart the way forward for ‘Go to Village’ mission within these 2-3 days. Recently, the State Cabinet has decided to provide some allowance to the government employees who are executing their work in far flung areas of the State under ‘Go to Village’ mission, he continued. On the occasion, Chief Minister also launched the website of ‘Go to Village’ mission. The websitewww.gotovillage.inis powered by Department of Information Technology, Government of Manipur in association with X-treme Wave besides launching a booklet on ‘Go to Village’ mission.